Patient recruitment continues to be one of the biggest barriers to successful clinical trials. 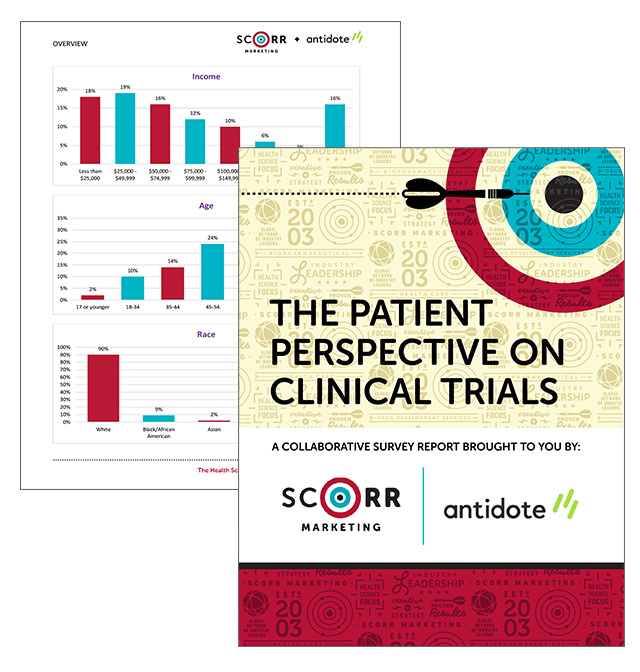 Now, SCORR Marketing and Antidote Technologies have teamed up to research patient attitudes toward clinical trials and other health-related topics. This research, gleaned from nearly 4,000 patients, has been summarized into a comprehensive survey report, The Patient Perspective on Clinical Trials. The report taps into the attitudes and motivations of patients diagnosed with conditions such as diabetes, kidney disease, cancer, multiple sclerosis, lupus, gastrointestinal disease, and asthma and allergies. These critical insights can help the clinical research industry develop more informed strategies that are efficient for companies and meaningful for patients, ultimately helping to advance the development of drugs and medical devices. In addition to the summary data previously released in our complimentary report, this enhanced report includes condition-specific patient profiles to help inform patient engagement and clinical trial recruitment strategies and align them with patient priorities, preferences and motivators for participating in clinical trials. Each patient profile includes insights into how education, income, age, race/ethnicity, gender and prior clinical trial participation influence their thinking. Neither Antidote nor the survey partners have or will receive financial compensation from the sale of this survey report.